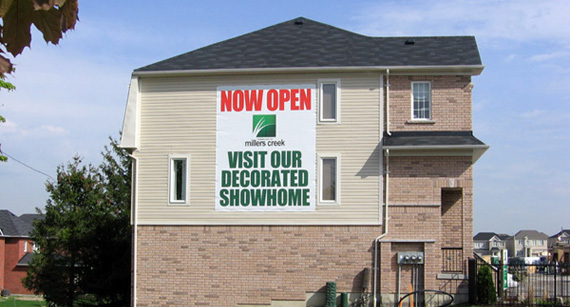 Freeman and Peter Signs has been providing customer satisfaction throughout Toronto and the GTA since 1977. We have hundreds of happy (and visible!) customers, and we hope to be of service to you for all of your signage needs. Please contact us via email, phone, or if you have time fill out our online quote for a no obligation estimate. References happily provided upon request. With the use of our grand digital imaging we are able to print your precise image in all sizes, from cut out lettering and decals all the way to hoardings and billboards. As a result of our years of experience, Freeman and Peter Signs can produce long lasting printed boards, hard-wearing vinyl banners, scaffolding covers and building wraps to any specification. These signs make use of a highly visible surface area to extend your brand image, communicate messages and advertise new products and services to a wide audience, which can be targeted specifically depending on the location. In the past digital prints for many signs were printed on paper or plastic and then laminated onto the sign surface, resulting in a dull, flat look. Today with our advanced printing technology, we are able to print directly onto the final substrate. UV curable printing direct to substrate has a number of advantages, including vibrant detail and image sharpness across a wide spectrum of colors. This ability to print your design directly onto clear acrylic, brushed aluminum, and many wood surfaces gives you wider options along with increased precision. In three important areas UV-curable inks excel over solvents: rapid drying characteristics allow unencumbered high-speed printing, substrate versatility (direct adherence to both flexible and rigid materials) greatly widen applications and eliminate the time-consuming step of mounting a printed substrate on a hard base; and finally, having no Volatile Organic Compounds they offer considerable environmental benefits.